Astall was known as a quick and powerful right-winger who would use his superb physique to bomb past defenders. He was nicknamed 'Cannonball' for the ferocity of his shot, which would explain his impressive goal-scoring ratio from the wing. Argyle was his first professional club, after playing for the Royal Marines and as an amateur for Southampton, and he took very little time to establish himself as a regular starter. His career at Home Park seemed to falter after a bright start, but he soon recovered after the Pilgrims slipped into Division Three in 1950. Astall's form for Argyle led to him being called-up to the England 'B' Squad, despite playing for a Third Division club. He joined Birmingham City in 1953, spending nearly eight years with the club, and went on to earn two full England caps. After being granted a free transfer, he moved to Torquay United and spent the last two years of his career there. 'Flash' and 'Cannonball', the names of contemporary comic book heroes and applied to Gordon Astall by supporters during his spell at Home Park, immediately convey the style adopted by this right winger, a style based on pace and power. Astall, who had an extremely strong physique, would storm past defences and either deliver a hard cross at head height to his attacking colleagues, or crash in the type of shot which made his nickname so appropriate. He had another weapon in his attacking armoury: he would take any throw-in awarded to Argyle near the opposition goal-line and those strong arms could hurl the ball from the touch-line, right into the middle of the goalmouth and throw many a defence into confusion. Service with the Royal Marines brought Astall to Plymouth and to Argyle's attention in the late 1940s. 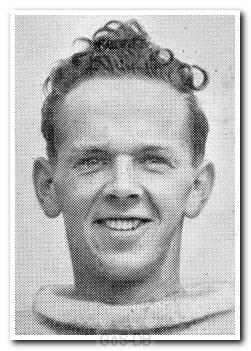 He made his Second Division debut on the Argyle right wing in February 1948, Two months after signing professional forms for the club. After a bright start, his career seemed to falter for a while and times when he looked raw and inexperienced. But Argyle's descent into the Third Division in 1950 saw, among other developments, the rejuvenation of Gordon Astall and it was as a Third Division player that he was selected for the England 'B' side in 1952, the first England honours to come the way of an Argyle player since Herbert Batten played against Australia in the FA's 1925 tour. It was not until he left Home Park, however, that Astall was able to add to those honours. Birmingham City, having already signed Alex Govan in the summer of 1953, moved for the other Argyle winger a few months later. While with the Midlands club, for whom he made over 200 League appearances, Astall won two full England caps, was chosen for the Football League representative side and played in the 1956 FA Cup Final. Like Govan, he returned to the West Country to end his career, although in Astall's case he ended his career with Torquay United, then settled in the Torbay area.